Harry’s is Singapore’s best dining and bar establishment to enjoy an ice cold brew and delectable treats in a stylish and welcoming getup. Have you seen our Harry’s Bus driving around? Snap an image of the delicious looking buses and enter yourself into the contest where you could win $200 credit into your Harry’s SG App! 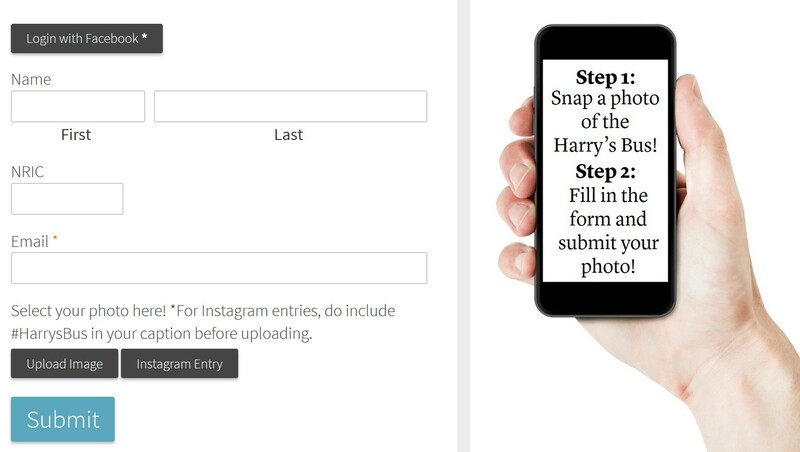 Grand prize- $200 credit into your Harry’ App! Consolation prizes- 5 X $50 credit into your Harry’s App! Find out more at Harry’s Singapore Facebook page to find out how to Win $200 Credit Harry’s SNAP & WIN Contest. Harry’s story begun in 1992 with its flagship outlet along the scenic Singapore River. Over the years, it grew into the nation’s most well-established dining and bar establishment, with 20 outlets located across key business districts and suburban areas. Serving up quality treats and ice cold brews, Harry’s inviting and laidback ambience makes it the perfect location for a stylish getaway. Harry’s is home to many – the sports fanatics catching their favourite team in an exciting live telecast, colleagues unwinding after a long day’s work, friends catching up and singing along to the live band’s tunes, and even families spending quality time together on a weekend. With its expertise, Harry’s has also expanded with a catering arm, bringing its signature treats to make every event a delicious one. Dedicated to be the best dining and bar establishment in Singapore and beyond, one is never too far away for a good time at Harry’s.